Training has been spotty for the last few weeks. I've been focusing mainly on running with a couple bike rides on the trainer. I have yet to get back in the pool. With the weather changing, my new work responsibilities, and catching up on 6 months of chores, it's been difficult getting back in motion. The last three weekends I've done a couple brick workouts and definitely getting in long runs of 17, 18, and hopefully 20 tomorrow. Basically I'm getting in 5+ hours each weekend but the mid-week training hasn't been consistent. With the upcoming holiday, that might not happen until December. People have asked me what my next big race is. While I have registered for multiple 2014 races already, I'm debating on doing the Phoenix Marathon in January. My parents "winter" in Arizona and it would give us a chance to visit them there for the first time. With Phoenix being a flat course, it provides a great opportunity for a Boston Qualify. I'm still hoping I can ride the coattails of my ironman training into a 3:08 marathon. That would be a 21 minute PR and taking 30 minutes off my ironman marathon time. Technically I need a 3:10 but with the floating time cut-off, it may mean I need a 3:08 to actually get a bib after everyone has registered for Boston. I'm still thinking this is a possibility. I did 18 miles last weekend at an 8:08 average pace and I finished this morning's 10 miler with a 7:25 average pace (miles 6, 7, and 8 were 7:00, 6:58, and 6:47). To hit a 3:08 I have to run 7:10 pace for 26.2 miles. My plan would be to hang with the 3:05 or 3:10 pace group. That 11 mph wind was NOT fun. Tomorrow's 20 miler is going to be even colder. I just hope the wind is nonexistent. 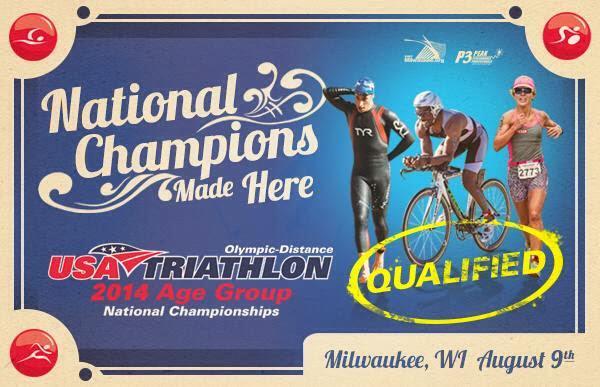 I got an invitation to participate in the 2014 Age Group National Championships! I'm still debating on participating because this race is two weeks before my "A" race of the year, Chicago International Triathlon. Having two international distance races within two weeks doesn't bother me but it means a lot of traveling in August. My hope is that I qualify every year, so if I miss this year I'd be invited back. My current age group and the 40 - 45 age group is pretty competitive, so it might not be that easy. To qualify you have to finish in the top 10% of your age group. I qualified at Beach2Battleship 140.6. I wouldn't worry too much about qualifying. I think I qualified for it at 4 races this year (humble brag).